The casino operator reported a 16 percent yearly drop in high-roller gaming volumes. But those players, symptomatic of China’s financial excesses, are fickle. Higher-margin mass players, driven more by healthy economic trends, look resilient, and Sands should benefit. 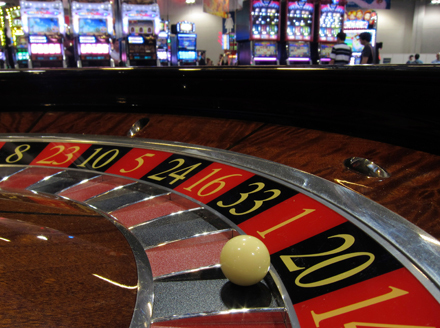 A roulette wheel in front of slot machines at Gaming Expo Asia in Macau. Casino operator Las Vegas Sands reported its results on July 17 for the quarter ending June, showing that VIP gaming revenues in its Macau casinos fell 5.7 percent year on year, to $1.1 billion. The group, which operates in the Chinese gaming enclave through its subsidiary Sands China, posted global revenue of $3.6 billion, up 11.8 percent from last year. It said total net revenue for Sands China increased 15 percent to $2.4 billion. Revenue from its Macau mass-market tables, where gamblers tend to wager smaller amounts, was up 34 percent year on year to $1.25 billion. Shares in Las Vegas sands closed down 0.57 percent to $73.80. At 10:40 a.m. (0240 GMT), shares in Sands China, which is listed in Hong Kong, were down 1.3 percent to HK$55.7.